Home Streaming Guides Twitch Marketing Social Media For Twitch Streamers 233 Twitch Followers in 7 Days – How did we do it? 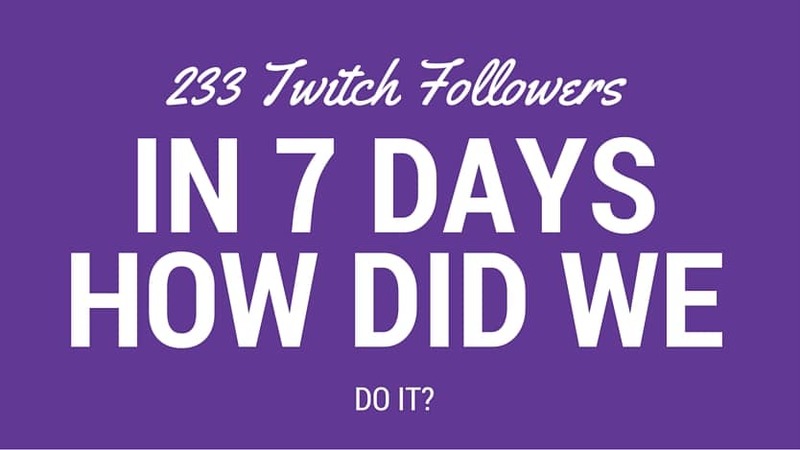 233 Twitch Followers in 7 Days – How did we do it? Finding the right place to advertise your stream is pretty hard. Some places work and some places just won’t get your stream any viewers. I have been really digging into how streamers market their stream with a mentality “What works the best”. There is quite a lot of tutorials that say that Twitter is the best place to do so. But i strongly disagree about that one. Facebook posts seems to get x2 – x10 times more likes, shares and comments than the exact same post on Twitter. Funny ain’t it? Okay since i figured out that Facebook seems to work i went on a search to find Facebook groups that other streamers use to promote their stream. I found couple good places that are: United Streamers – Twitch, Hitbox, Youtube, & others and Twitch & YouTube Following & Growing Together these groups are also pretty active helping out new streamers. You can discuss basically everything behind streaming on there. After getting into these groups i started to check out what get’s those likes and what doesn’t. The reality seemed to be the same thing that is going on in Twitter. Most of the posts that do not get any likes, shares and comments, are just plain boring or look a lot like advertisement. So it’s good to know that if something doesn’t work it’s probably that it just isn’t that good for advertising or it could work on another place. Good thing about images in the Facebook groups is that it will be in the groups images section forever so it’s going to market the stream really long time. Not forever though since it will get pushed down in the list when new images are uploaded. After we saw the affect of just posting live announcements for these two places we figured out why not to do it everyday? Couple days after the initial push were quite slower but still pretty good compared to earlier Mon-Wed: 28 to last weeks Mon-Wed: 0. Most of the time Chimmtv usually plays H1Z1 but her viewers have been asking her to play some CS:GO for quite awhile now. If we look at her steam group and what people in the group plays the most seems to be also CS:GO (You need to look at each peoples profile to see the hours). So why not try out the game that the folks already play? 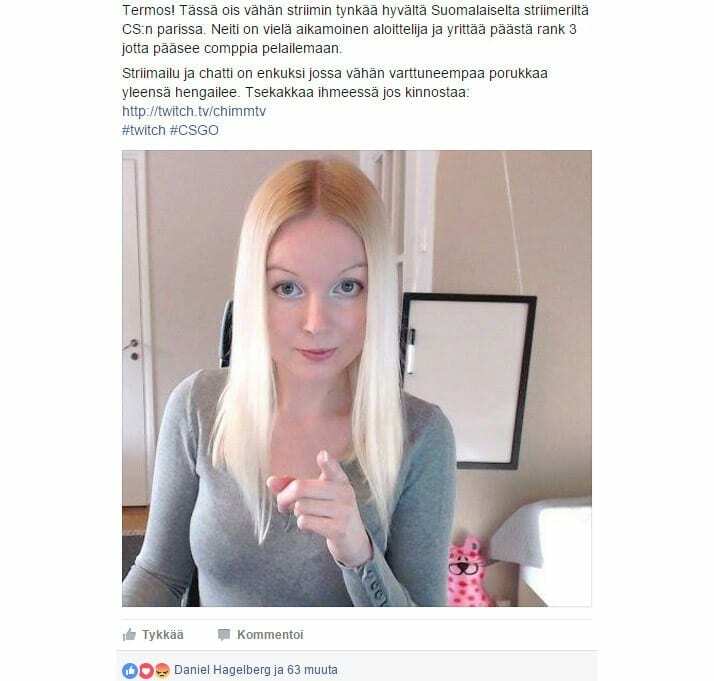 Chimmtv already told me that she is going to play CS:GO on Friday so i went on the hunt for some good Facebook groups where we can advertise her stream. I found couple global CS:GO groups but didn’t manage to get accepted in time for them. But i got accepted for: CS:GO Finland group that has over 13 000 members. Since Chimm is from Finland it’s good way to advertise on this group, even though she only does English streams. Most of the Finnish folks know English. Here is the post that sky rocketed the followers on Twitch. : 142 followers in one day. This post was bringing more followers, likes and comments even while there was no stream on Saturday at all. I know that you don’t most likely know Finnish language so below is the post turned into English. Hello! Here is some streaming action going on from good Finnish stream for CS. Lady is still learning the ropes for CS:GO and she is trying to get to rank 3 so she can play competitive games. If you are going to try out this kind of advertising in niche groups. I would suggest you to ask a friend or a mod to do the advertising. He/She can also reply to comments while the stream is on. Witch pumps up the conversation to the top in the group witch results for even more people seeing the actual post. Also there will be trolls! It’s easier for a friend/mod to take care of these so you can just focus for the streaming. “Do not advertise your stream here” = But your friend is allowed to do so. Just not the streamer itself. Testing out this was pretty fun and i guess will be doing daily adverts for chimmy in the future. Good thing to note is that you can mix it up little bit and it even seems that the “Works badly” posts actually work in niche groups. Not as good though if there is an image. I guess it’s because without the image the stream is going to start play on Facebook and the viewer can’t see the chat so he/she can’t engage that well. But using an image he/she has no choice but to go to the actual channel to see the stream. I hope this post helps you to think of new ways to promote your stream to greatness and even have fun while doing so! It would be great to hear what works for you also! You can leave comments below here.